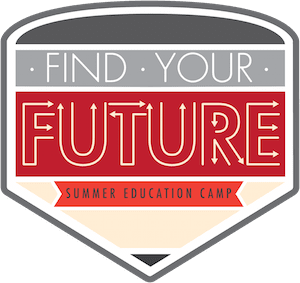 The OU Jeannine Rainbolt College of Education is excited to announce that we will be hosting the Second Annual Find Your Future Summer Education Camp from July 9-14, 2017! Thanks to a generous donor, the next $2,000 in contributions will be matched dollar for dollar for DOUBLE the impact! The Find Your Future Summer Education Camp is led by Associate Dean T. Elon Dancy II, Ph.D. and Krystal Golding-Ross, M.Ed. with the support of outstanding faculty members in education and other departments across campus. This five-day residential summer program is designed to recruit and prepare high school students of color who are interested in exploring the possibility of becoming educators. Last year 15 boys of color from around the OKC metro participated in the first-ever FYF camp and it was a great success! This year we are setting our sights high and expanding the program to include both boys and girls with an overall goal of 40 students! The camp is offered at absolutely no cost to participants and will include transportation to and from OU as well as housing, meals, and activities. Students who participate will be provided with opportunities to engage with guest speakers and panelists, faculty, and current students who can serve as mentors to help them be successful in high school and beyond. As you may well be aware, the state of Oklahoma is facing an unprecedented shortage of well-qualified teachers, particularly teachers of color. In the Oklahoma City metro area, approximately 80% of students identify as people of color. However, only 25% of teachers within the area identify as a person of color. Students can't be what they can't see! 32.9% of all Oklahoma teachers identify as a person of color. With 50% of children across the state identifying as people of color, this number is not proportionate. The need for a diverse teaching force is constantly growing as the student body across Oklahoma becomes increasingly more diverse. We want to close these gaps, but we need YOUR help! The Find Your Future program is funded primarily through (tax-deductible) contributions from people like you, so we need your help to make it happen! The more money we have, the more students we will be able to accept. With the help of our OU family, we can fully fund the camp to make a life-changing experience for the students! We appreciate your contribution to our campaign! This program would not be possible without the support of our friends and colleagues who share our passion for education and ensuring that all children have access to a positive learning environment with great teachers who understand their needs. After donating, please share on social media and let your friends and family know about this program and how they can help! Thank you for your commitment to ensuring the success of Oklahoma children! Your gift will help us provide snacks in the afternoons and in the residence halls. Your gift will provide transportation for one student. Your gift will provide all meals for one student for one day. Your gift will provide one student with housing for one day. Your gift will provide all meals for one student for all five days. Your gift will all housing costs for one student. Your gift will provide full support for one student - including transportation, housing and meals, and activities.